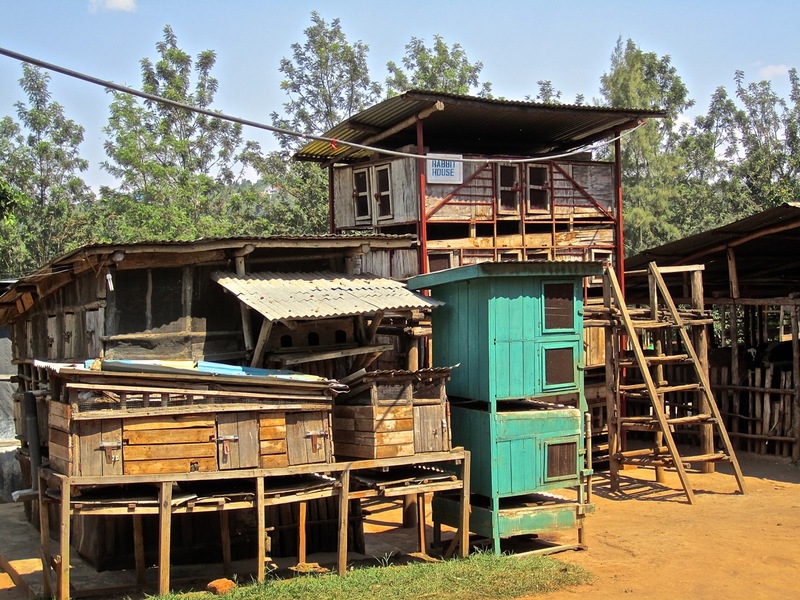 After we visited the demonstration small holding farm of Gako Organic Farming Training Centre (GOFTC), we continued down the road a short distance to its main campus. 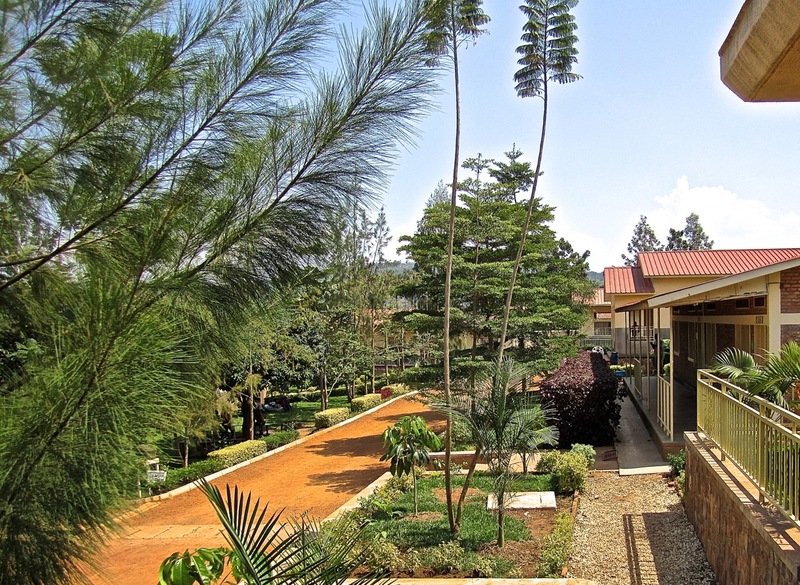 The attractive facility includes a number of classrooms and an auditorium. A local church group was holding a service on the grounds while we were there, and we enjoyed their singing as we looked around. We came to a large field of various types of garden beds, including the above terraced mound garden of carrots, onions, and parsley . . . 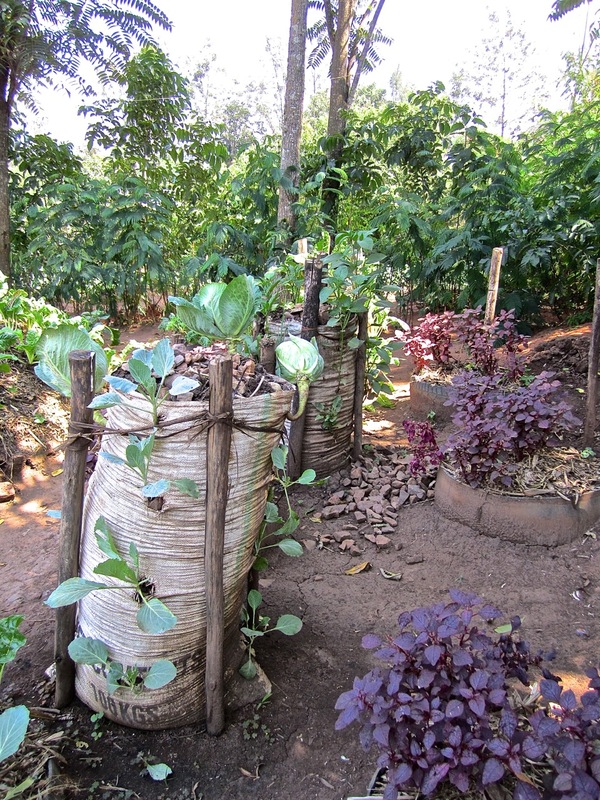 Above, cabbages were growing in sack towers, and old tires had been repurposed as containers for herbs. 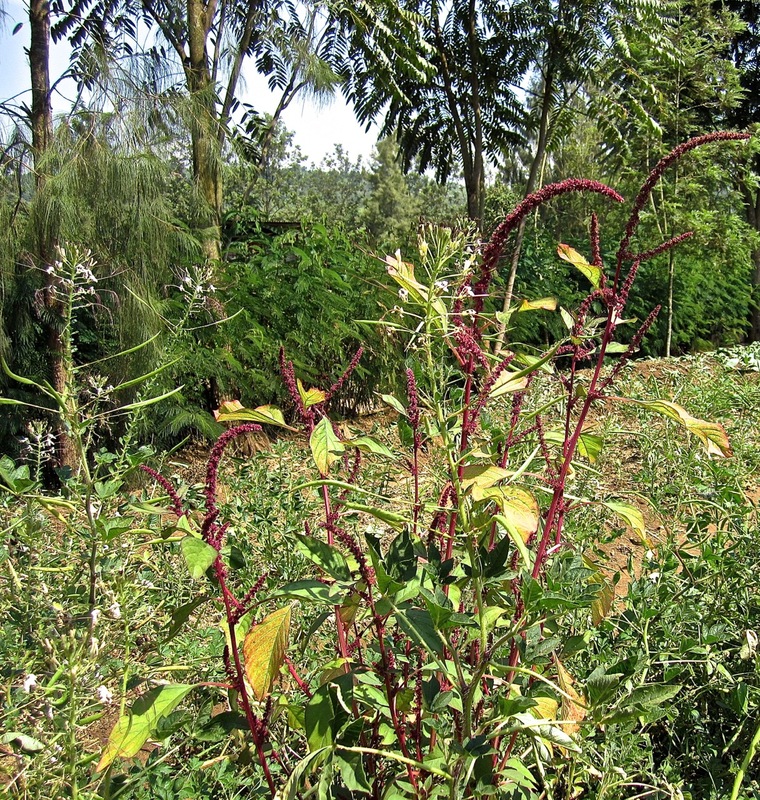 Amaranth was growing in rows. 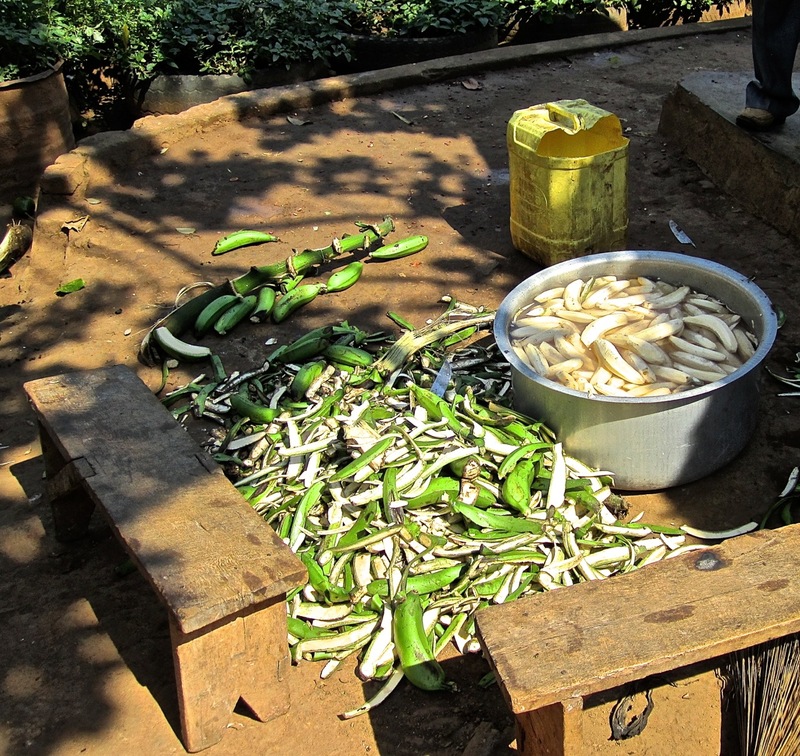 In Rwanda, it is valued more as a leaf vegetable than a grain. I was surprised to see the Cleome around it (in the photo, but a little hard to see), but I learned from Managing Director Richard Munyerango that the leaves are edible after cooking. 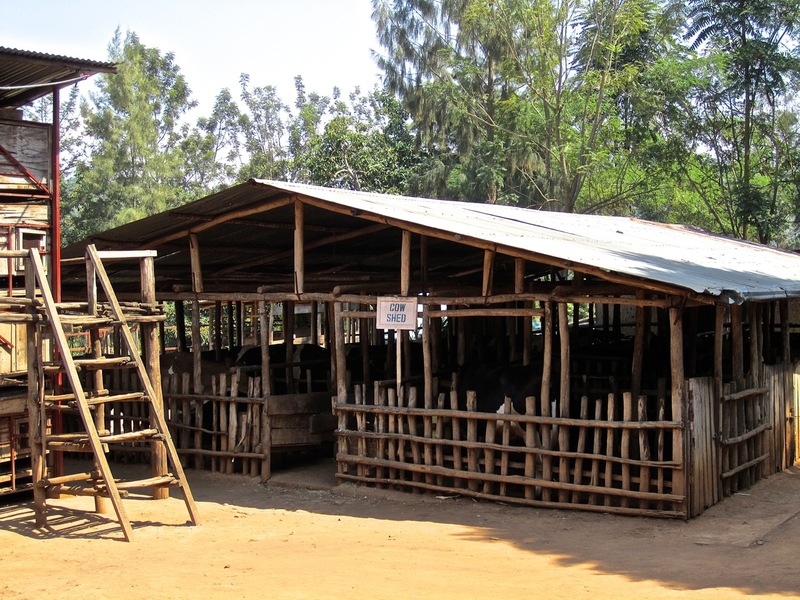 The center teaches animal husbandry and keeps a number of dairy cows using the “zero grazing method,” which means fodder is brought to the penned animals (they do graze twice a week). 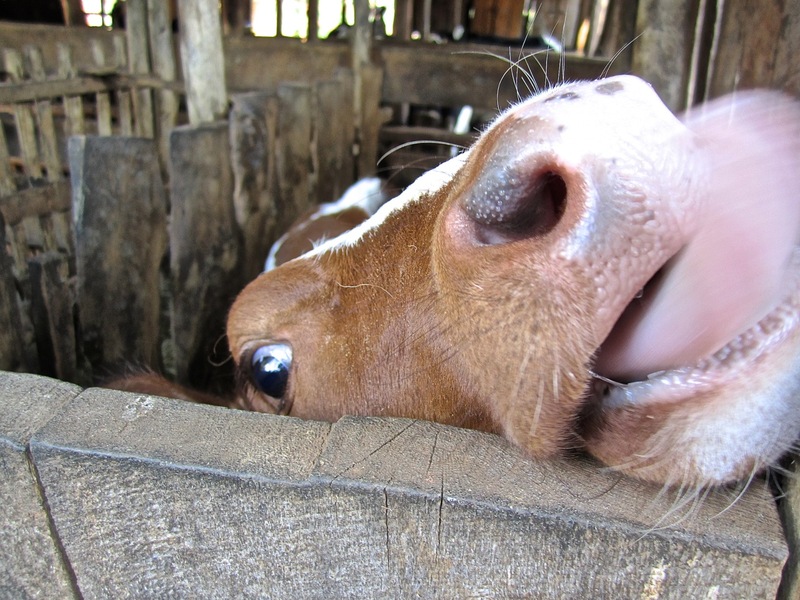 This calf was checking out my camera. 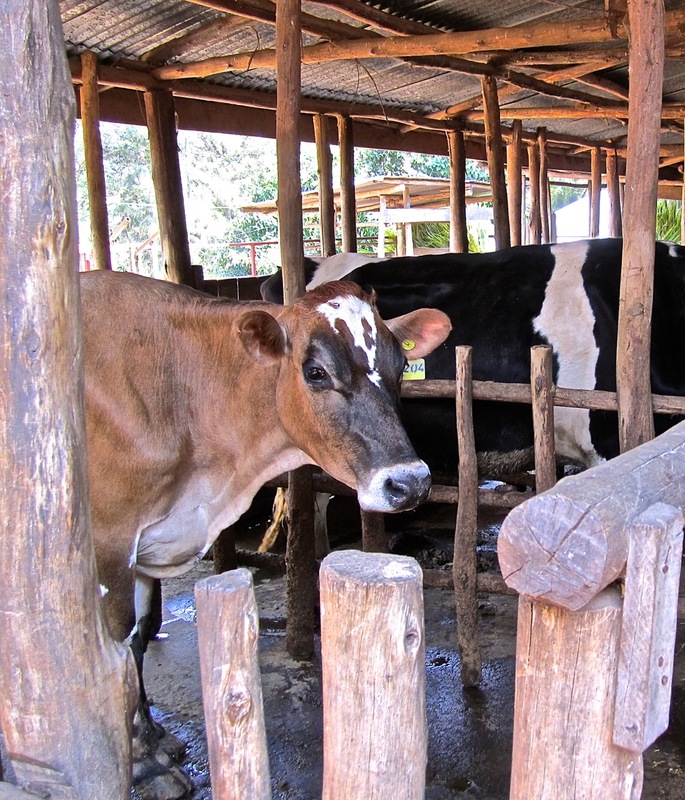 In addition to milk, the cows contribute to the center’s power through their manure, which is processed to produce gas for cooking. The staff were cooking bananas that day. These bananas are not sweet and when boiled and mashed taste something like potatoes. 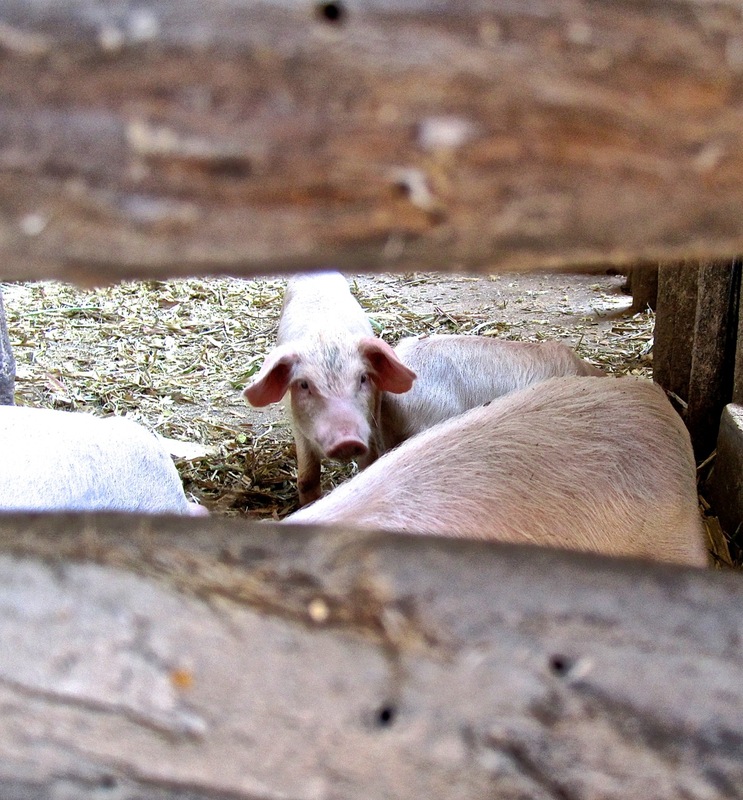 You may remember GOFTC’s pigs from my July 4 “Wordless Wednesday” post. This baby was a little more shy. 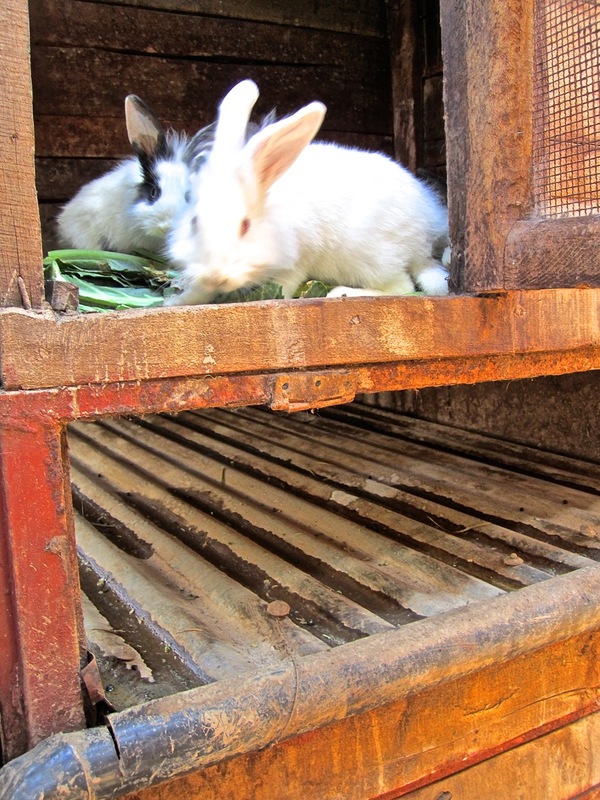 The center has an even larger rabbit hutch at the main campus. 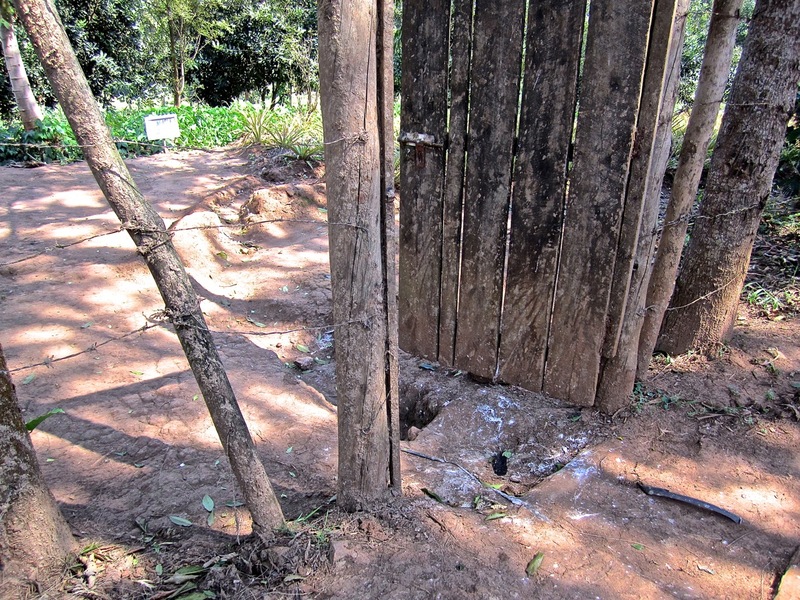 Of course, the urine is collected for the compost piles. 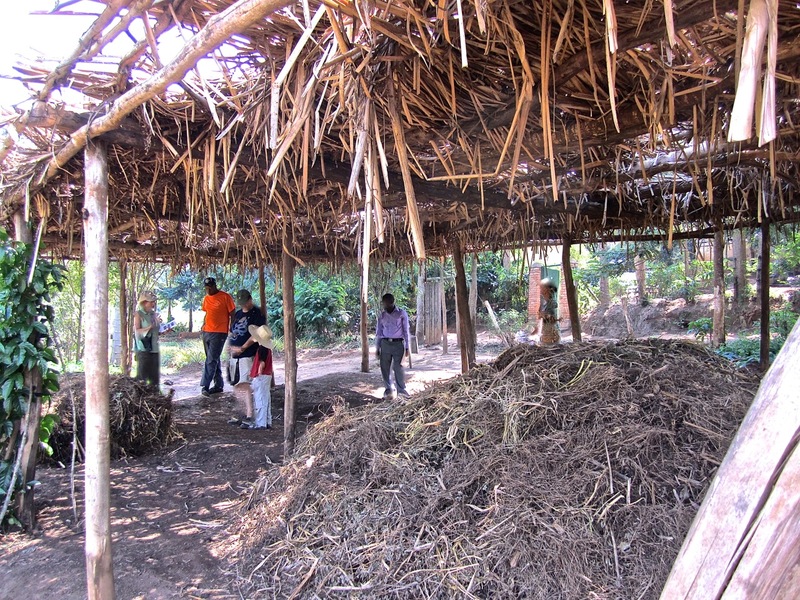 After we left the animals, we came to the compost shed. The still-cooking pile on the left was beautifully squared off. Richard told us good dimensions for a pile are 1.5 meters wide by 1.5 meters high (and 7 meters long, but this one was about 3-4 meters long). This is clever (above). A pole is placed in the middle of the pile so that it can slide in and out. If it is pulled out warm and damp, the pile is in good shape. 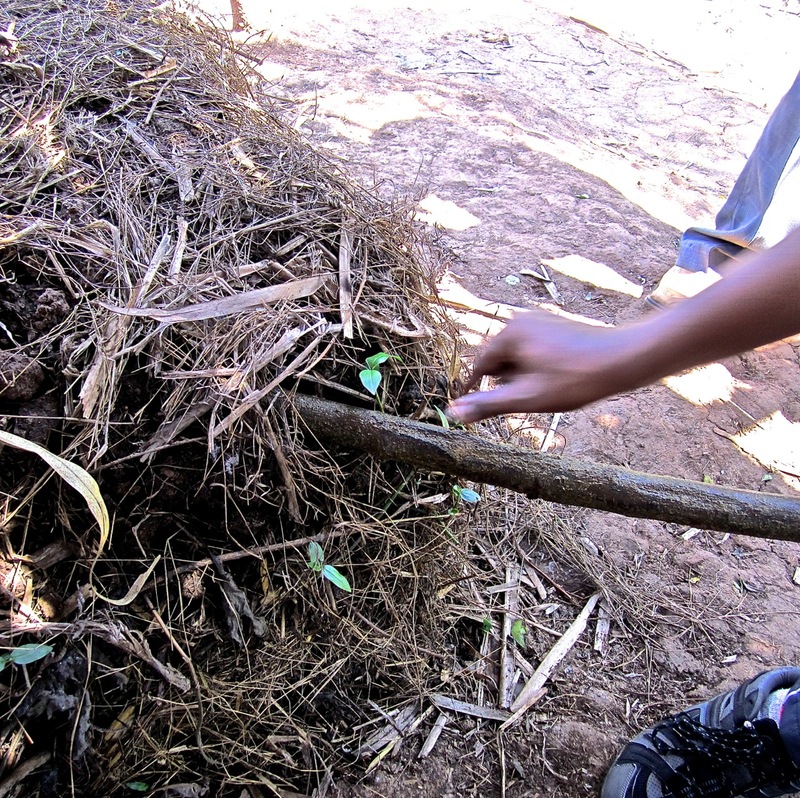 Next to the compost shed, different types of soil amendments (compost, compost tea, manure, etc.) were being tested on Amaranth. 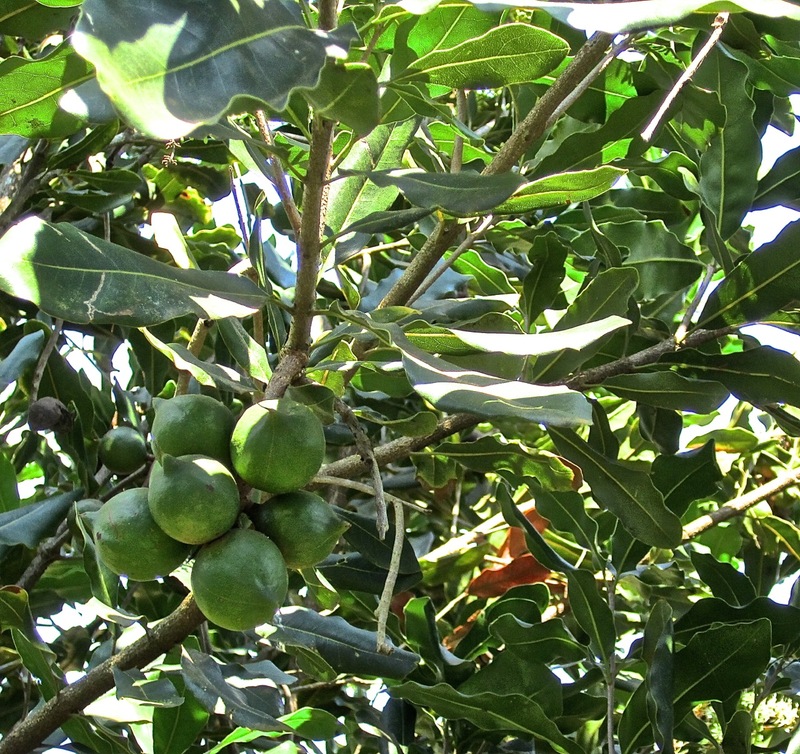 There were macadamia trees planted next to the test plot. 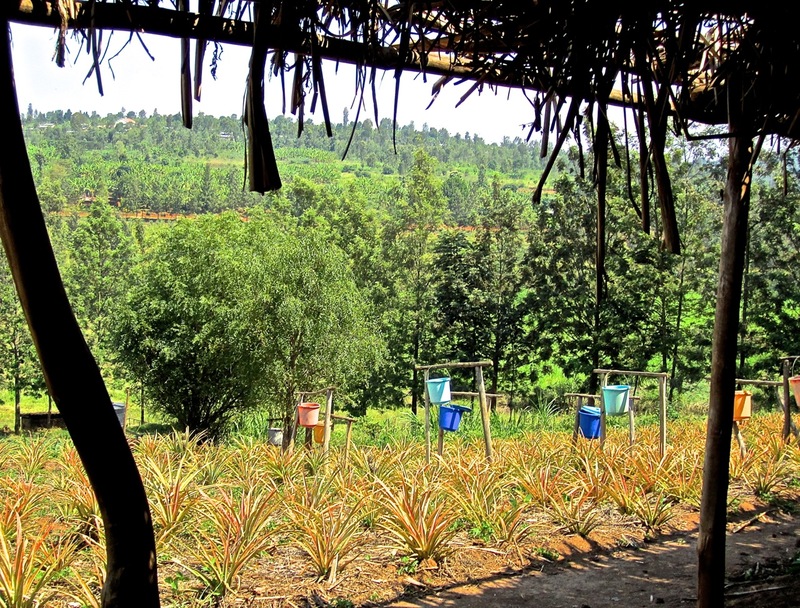 From the shed, we could also see fields of pineapples — their drip irrigation buckets still hanging at the end of the rows. 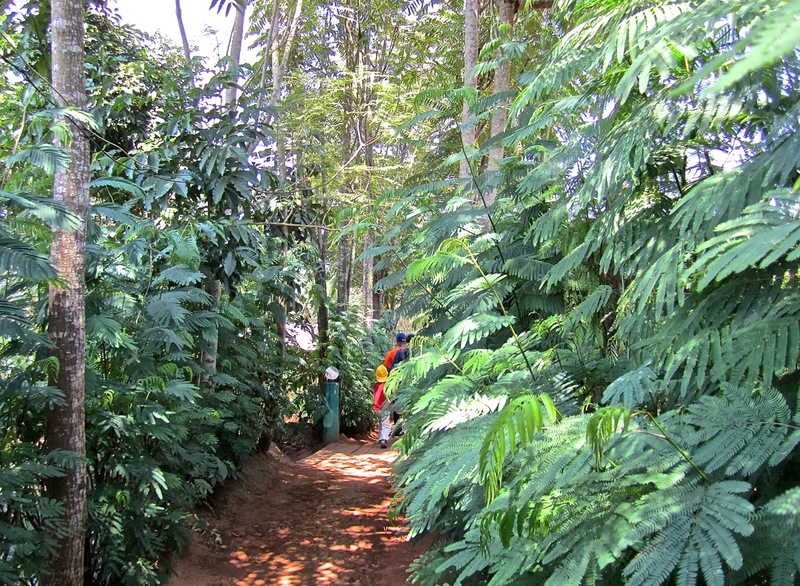 The drip lines — needed when the plants were first set out — had been removed. But when they were in use, workers had filled the buckets by hand from a well below the field. Eventually, a pump system will be installed. 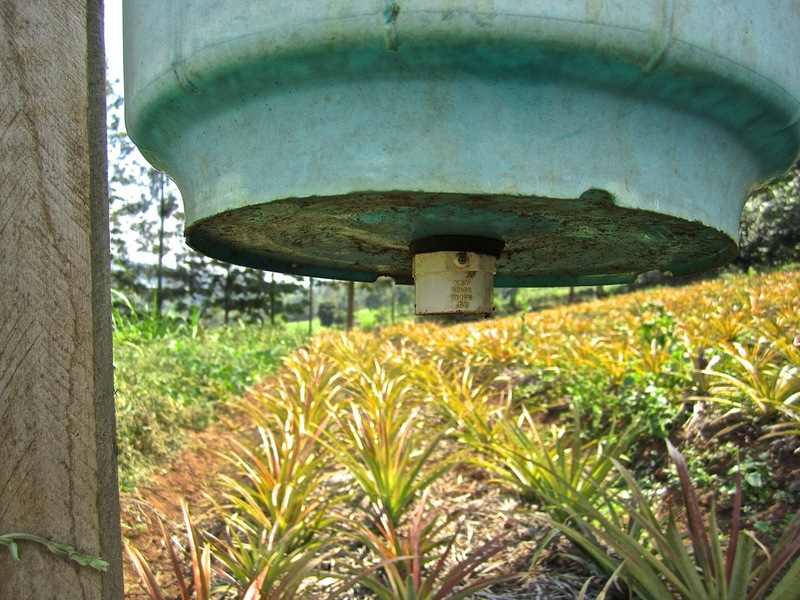 The pineapples are fertilized with a solid byproduct of the “cow gas” process. As we left the fields by this gate, I noticed again the careful capture of rainwater runoff using trenches. I thought I would end by sharing some of the text of GOFTC’s brochure, which is rather inspiring. 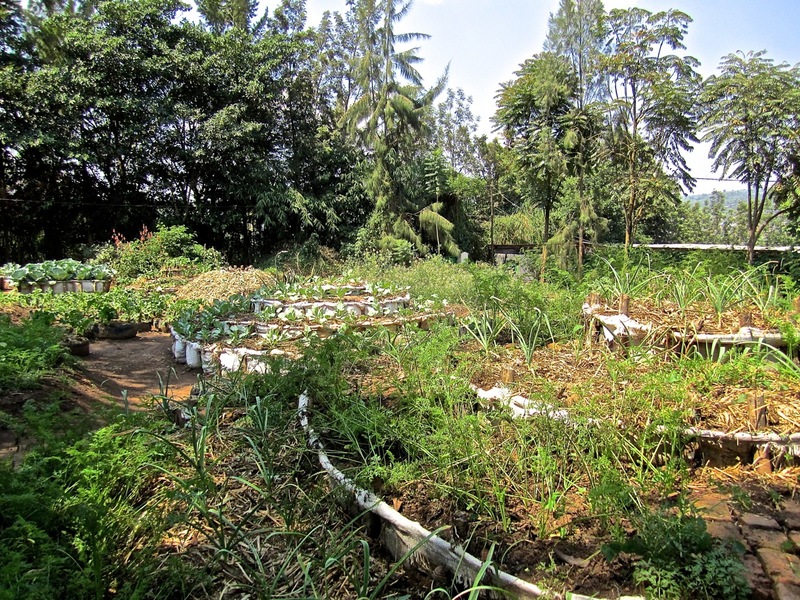 “Gako Organic Farming Training Centre is a Rwandan local NGO that trains farmers in sustainable agriculture for sustained livelihood. We are a training and demonstration enterprise. 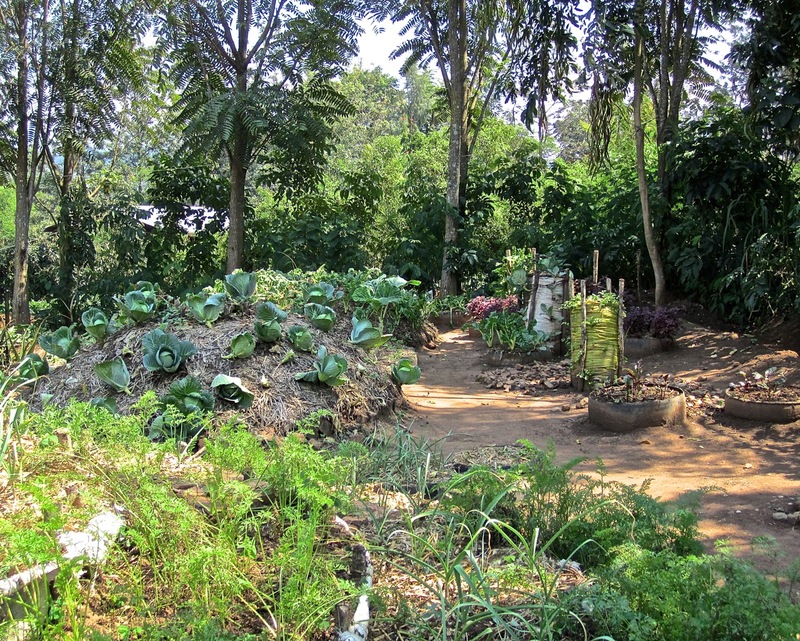 The training is in sustainable agriculture using organic farming practices, which are environmentally friendly. 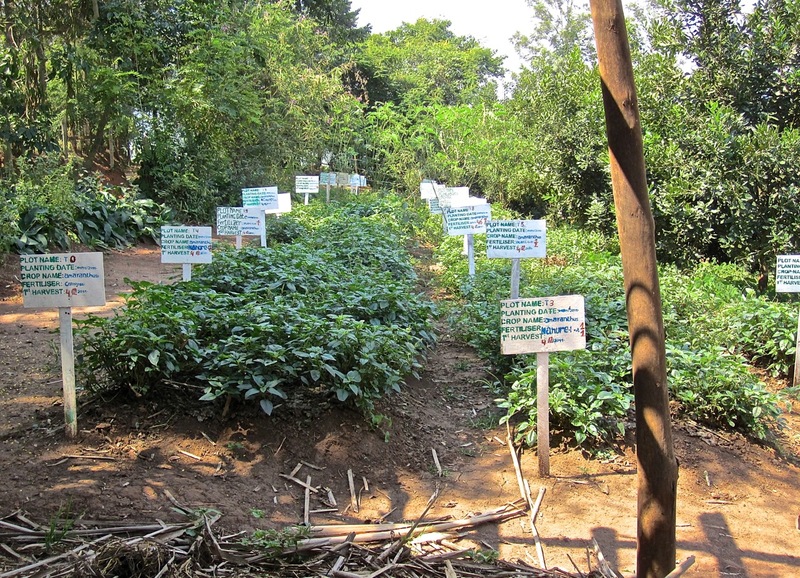 We emphasis the use of limited land (small plot technique), while improving yields, which are pollution free, hence safe and healthy to eat. We do not encourage the application of artificial fertilizers and pesticides, but try to go back to nature, by taking care of our environment so that we may depend on it for our livelihood. 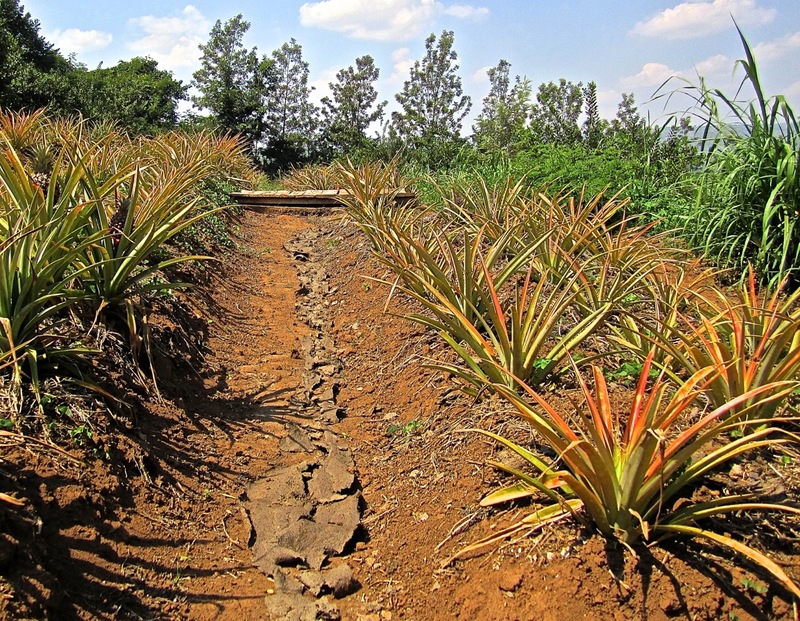 We embark on planning and design, while focusing our most attention on agro-forestry and the growing of fruits and vegetables, which are natural medicines. 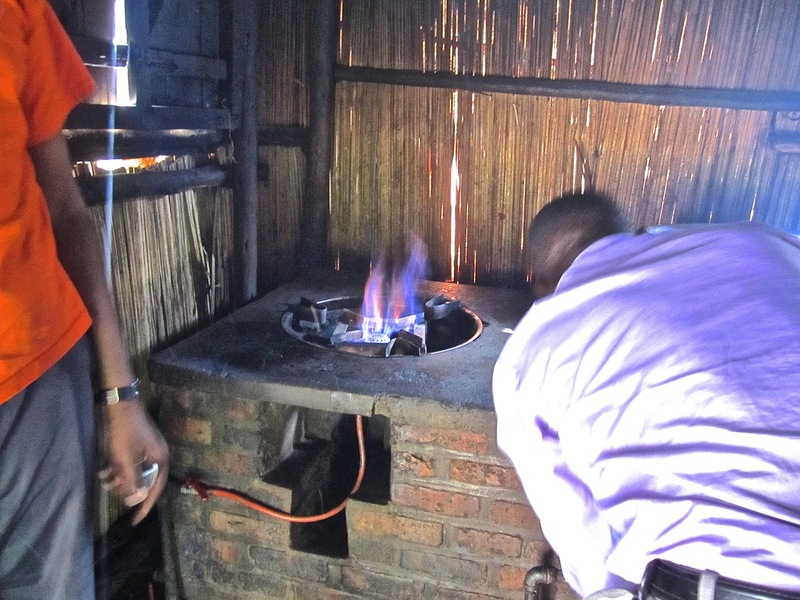 Since inception, GOFTC has shared this information with hundreds, if not thousands, of farmers in Rwanda and the neighboring countries who come for training. . . .
You can read more about GOFTC in a January 2011 post by Jared in the blog Rwanda on the Wing. You can contact GOFTC by writing to P.O. Box 3047, Kigali, Rwanda, or by e-mailing to goftc2008@yahoo.com. Cindy, This is an inspiring operation; it gives me hope for the future.